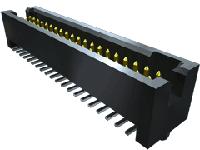 This rugged Tiger Eye™ terminal strip features a multi-finger, BeCu contact system designed for high reliability and high cycle applications with surface mount or through-hole tails. Vertical or right-angle orientations for parallel, perpendicular and coplanar mating increase design flexibility, along with optional alignment pin, locking clip, dual screw down or weld tab for more rugged applications. Click here to see a full list of mates related to TFM. We're having trouble loading our TFM 3D Models. Please refresh the page to try again. If you continue to experience issues please contact ehelpdesk@samtec.com for assistance. We're having trouble loading our TFM Models. Please refresh the page to try again. If you continue to experience issues please contact ehelpdesk@samtec.com for assistance. We're having trouble loading our TFM SI Performance data. Please refresh the page to try again. If you continue to experience issues please contact ehelpdesk@samtec.com for assistance. We're having trouble loading our TFM SIBoard. Please refresh the page to try again. If you continue to experience issues please contact ehelpdesk@samtec.com for assistance. We're having trouble loading our TFM Protocols. Please refresh the page to try again. If you continue to experience issues please contact ehelpdesk@samtec.com for assistance. We're having trouble loading our TFM Catalog Pages. Please refresh the page to try again. If you continue to experience issues please contact ehelpdesk@samtec.com for assistance. We're having trouble loading our TFM Prints & Footprints. Please refresh the page to try again. If you continue to experience issues please contact ehelpdesk@samtec.com for assistance. We're having trouble loading our TFM Series & Mates. Please refresh the page to try again. If you continue to experience issues please contact ehelpdesk@samtec.com for assistance. We're having trouble loading our TFM Test Reports. Please refresh the page to try again. If you continue to experience issues please contact ehelpdesk@samtec.com for assistance. We're having trouble loading our TFM Technical Library. Please refresh the page to try again. If you continue to experience issues please contact ehelpdesk@samtec.com for assistance. We're having trouble loading our TFM Compliance & Quality. Please refresh the page to try again. If you continue to experience issues please contact ehelpdesk@samtec.com for assistance. We're having trouble loading our TFM Product Tools. Please refresh the page to try again. If you continue to experience issues please contact ehelpdesk@samtec.com for assistance.